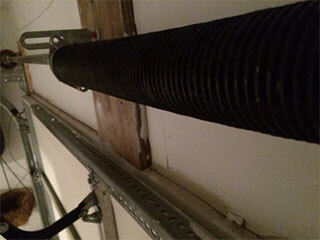 Garage door springs are considered to be one of the most important parts in your setup. Few other components span their functionality in ensuring operation, stability and user-safety in the way that they do. They work in pairs to distribute the weight of your door while keeping it balanced. In addition, they also keep the door secured to its brackets. Because of this they work under immense pressure even when not in use, causing frequent repairs, replacements and maintenance to operate at top condition. Our team of technicians is here to assist you with this, call us now for further details. Whether you need to have a new set of springs installed, or are looking to replace your current ones, out team has the experience to make sure that the job is done properly. We will provide you with whichever type of springs your door requires, whether they are overhead or torsion coil trampoline springs. Our technicians also offer routine maintenance services to lengthen the lifespan of your springs. These services include inspections which allow us to notice possible failures before they occur, so that we can either repair or replace them depending on your needs. We can also offer tougher solutions in the form of galvanized or oil tempered garage door springs, which will give you greater lift and more protection from the elements. When you notice signs of stress, cracks, warping, corrosion or rust, contact one of our technicians to have these issues repaired before the problem worsens and you need to have the spring replaced. We offer both overhead and extension spring repairs for all types of doors, so call us now if you need to have your set checked. With our assistance, you can be sure that your garage door springs are always in the best condition. For further details on our services, contact a representative from Garage Door Repair Tomball today.